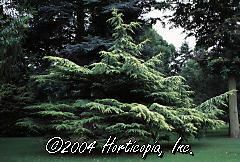 Golden variant of Blue Atlas Cedar. Sunlight exposed foliage is yellow-gold; shaded is blue-green. Grows 12 inches a year--forming a broad, pyramidal tree. 10 feet in 10 years.